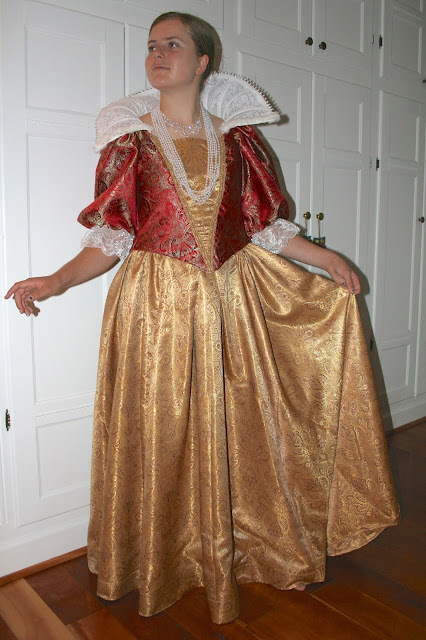 My daughter is in her school's production of The Three Musketeers this Fall and I am helping with costumes. I have a small stack of costumes that need altering but first I have to make a bodice to go with a skirt that she has to wear for the Ball scene. Remember this dress from last year? I made this when my daughter had to be Queen Elizabeth1st for something at school. The bodice and skirt are two separate pieces so I am going to use the same pattern for the new bodice I need to make. 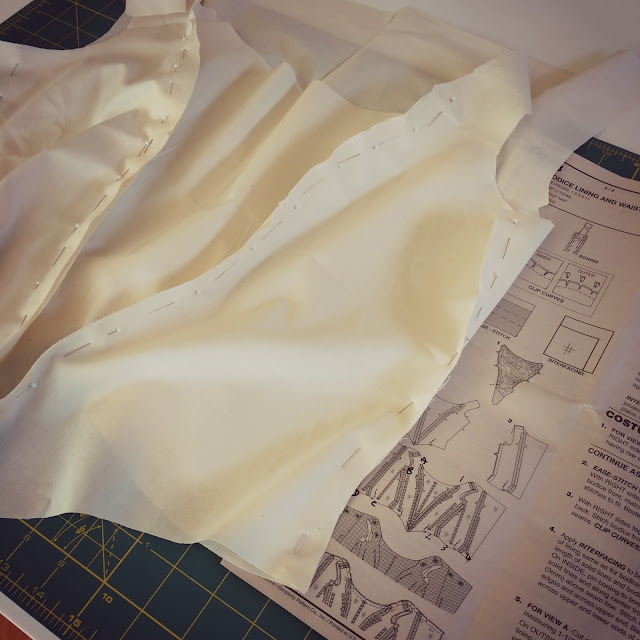 It should be a bit easier this time around because I'm familiar with the pattern and will know how to use the boning! Also I won't need to make that big lacy stand up collar! 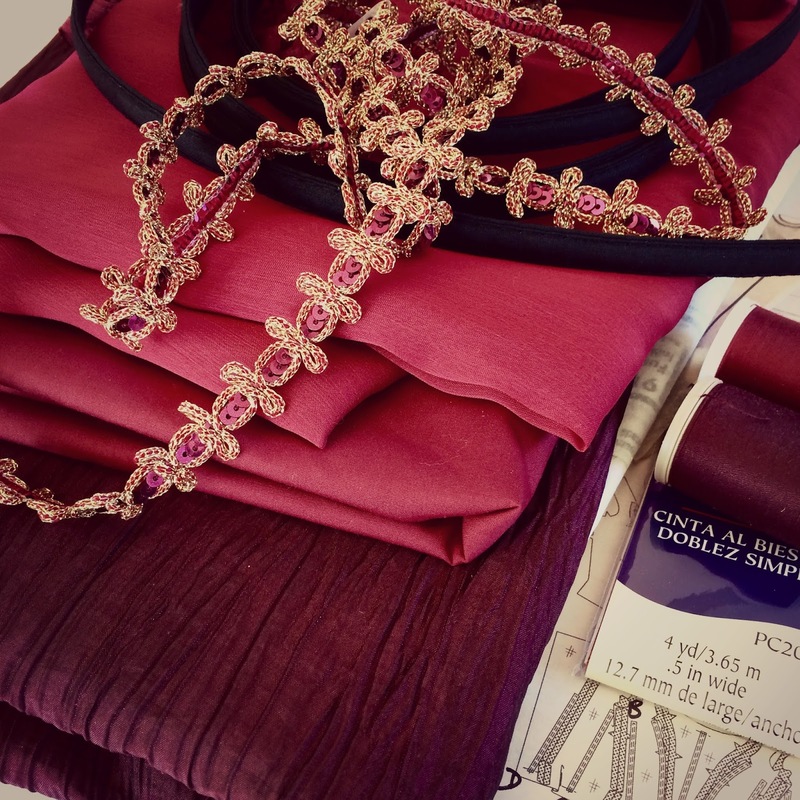 There is a dark green and burgundy skirt from the drama department that she will wear so I needed to find some fabrics that coordinated and this is what came home with me. The dark fabric at the bottom of the pile will be the main fabric. On top of that is a soft cotton for the lining and on the top of that is a dark red chiffon type fabric for the sleeves. I've started by making a fabric version of the pattern which I pinned together and then fitted on my daughter this evening. This step takes extra time but ensures a really good fit. Tomorrow I will take out all those pins and mark the adjustments before using those fabric pieces to cut out the red fabric. I'm enjoying having a different kind of sewing project to work on but I'm still working on some pincushions as well! It has been 100f again here this week so this has been a good excuse to stay inside and sew!